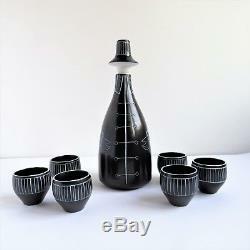 Arabia Finland Tarina Ceramic Bottle with 6 small ceramic cups/ shot glasses. Tarina means Story in Finnish. 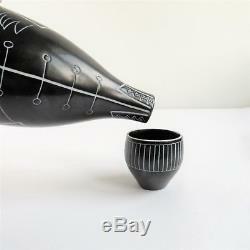 The ceramic bottle and shot glasses are matte black, with the design being done in a sgraffito technique in white. I think the bottle would be great to serve some vodka, snaps or liquor in the tiny beautiful cups. The bottle is in the shape of a person, dressed in a long buttoned coat with some addornment on the neck in a somewhat Russian-resembling style. 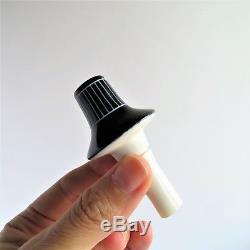 The ceramic stopper mimics a hat. 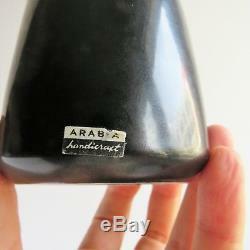 There is a paper label on the bottle, slightly damaged, reading "Arabia Handicrafted". The base of the bottle and glasses is stamped in white "Arabia Made in Finland", with the Arabia crown on top of the lettering. The shot glasses have a vertically striped band. These items are handicrafted, beautifully made by accomplished and competent artisans. Each set is therefore unique. The design is by Eira Kaar, Leena Vuorinen and dates from 1953. Bottle's height (with stopper): 21 mm/ 8.3 inches. 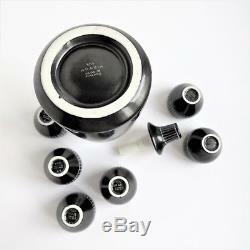 Bottle's diameter (base): 80 mm/ 3.1 inches. Cup's height: 40 mm/ 1.6 inches. 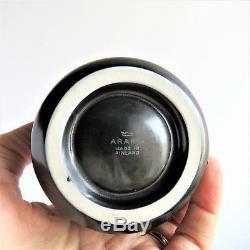 Cup's diameter (opening): 40 mm/ 1.6 inches. Weight (bottle + 6 glasses, unpacked): 558 g. Weight (bottle, unpacked): 330 g. Weight (1 glass, unpacked): 38 g.
No chips, cracks, flaws, restoration or signs of use. The item location is Lisbon Portugal. I will send it worldwide well packed and safe. 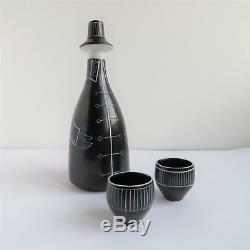 The item "Arabia Finland Tarina Ceramic Bottle with 6 shot glasses, Snaps Mid-Century Mod" is in sale since Wednesday, January 2, 2019. 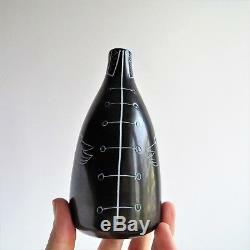 This item is in the category "Pottery & Glass\Pottery & China\China & Dinnerware\Arabia". 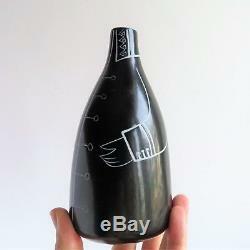 The seller is "sonicoutinh6" and is located in Lisbon. This item can be shipped worldwide.